Isha Ambani and Anand Piramal's pre-wedding ceremony in Udaipur is already the most happening event in the country right now and some of Bollywood superstars are taking it up a notch. 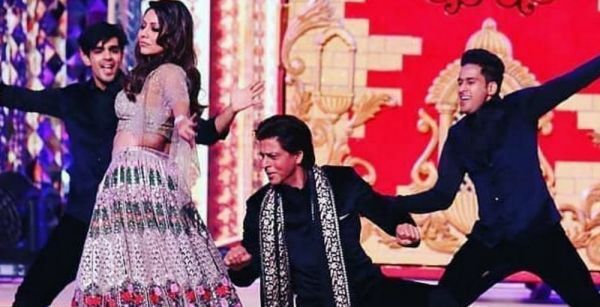 This weekend, the sangeet ceremony saw the A-listers of Bollywood, including Shah Rukh Khan, Aamir Khan, Salman Khan, Aishwarya Rai and Abhishek Bachchan shake a leg to some of the chartbusters. Shah Rukh brought his Badshah Of Bollywood avatar on stage as he charmed the crowd with a rare performance with wife Gauri. The chemistry at the sangeet made it an evening of love and romance. Shah Rukh was later spotted on stage swinging his hips to Shava Shava from Kabhi Khushi Kabhie Gham. Shah Rukh cheered for Aamir Khan and the two capped off with a fun-filled and energetic performance. Apart from the two Khans, Aishwarya and Abhishek also performed on stage to one of their most memorable songs, Tere Bina from the 2007 movie Guru. The Bollywood superstars looked jaw-droppingly beautiful in their Indian outfits as they danced to other Bollywood songs as well. The parents of the bride-to-be, Nita and Mukesh Ambani, also performed on stage with their sons Anant and Akash. The family danced to Maahi Ve from Kal Ho Na Ho, among others and gave us a Kodak moment. Even Salman Khan was seen on stage, dancing to Koi Mil Gaya from Kuch Kuch Hota Hai. SRK and his lady love, Gauri Khan also danced to the popular number from Yeh Jawaani Hai Deewani called Dilliwali Girlfriend. This is the first time Gauri has shown her dancing skills and we've gotta say she is a good match for the King himself. Also, KJo took the stage with the bride, Isha and they both jammed to Bole Choodiyaan. Epic desi wedding performance, yes, yes, hell yes! All the G-U-J-J-Us in the house make some noise! Javed Akhtar, Shabana Azmi, Javed Jaffery and Urmila look freakin' adorable! Newlywedded Deepika Padukone dazzled in red and she's basically all of us after a few too many glasses of wine! And her hubby brought the energy (as usual) to his patent Khalli Balli step. Uff Ranveer, how do you steal the show at every wedding? Ain't nobody like our desi girl! And nothing like some good old Ed Sheeran for the couple to celebrate their love. Our fave dulhan, Isha did her bridal solo and looked absolutely breathtaking while doing it. Isha Ambani and Anand Piramal got engaged earlier this year in September at the beautiful Lake Como in Italy. After a dreamy engagement, the couple is now hosting their pre-wedding functions over this weekend in Udaipur. Reliance Industry's Chairman, Mukesh Ambani's only daughter is tying the knot in Mumbai on December 12. The wedding party is currently raising a toast to the couple and the illustrious guest list includes Bollywood biggies and world leaders.